There are some small things I've come to appreciate about wintertime: the serenity in snow, the silence and slowing down of the world... the beautiful white and blue of the world. Here in the Pacific Northwest, we have very mild winters. For the most part, our winters do bring the occasional snow, but it usually doesn't come until well after the New Year. Funnily enough, when the temperatures do drop to a freezing range, our typical wintry rainy weather goes away and it is sunny. Yes sunny. We recently had a bout of sunny days with freezing temperatures. A few days prior though, it had rained, so having sunshine was a nice little change. A little up the street from my house, there are large pits on the side of the road where water accumulates to form giant puddles. Given that it takes a few days for that water to dissipate, when the freezing temperatures hit, that water froze, resulting in some fun little frozen pools. 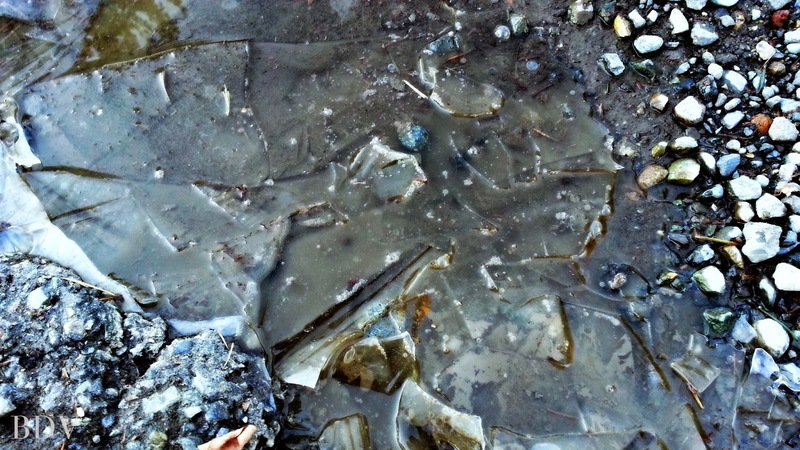 Like a child, I got excited by seeing the ice and could not help myself but to step on the puddle's delicate icy layer to crack it. Crack. Crack. Crack. So much fun! A little giddy feeling, I had decided to take photos of the puddle before and after so that I could have something to reflect upon. Remembering my childhood encounters with frozen puddles, I truly felt as though time had frozen and I drifted back to 10-years-old... with a jovial spirit. 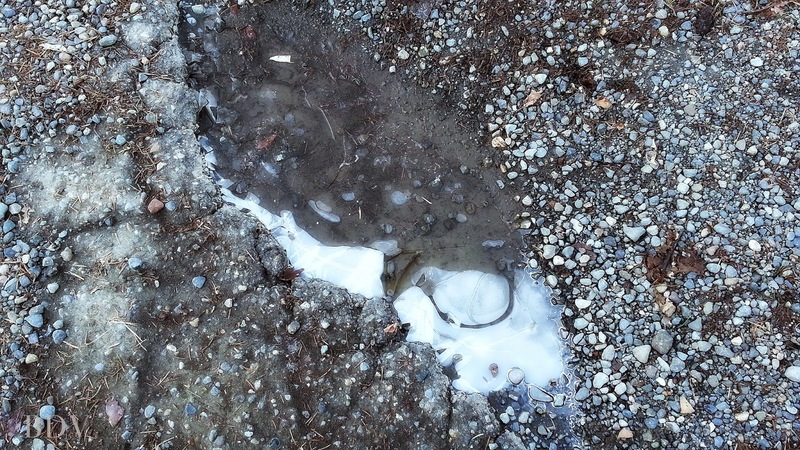 Do you like to step on icy puddles to crack them too? What are some things that you find yourself doing that brings you back to childhood?